Consumers will find that the new website mirrors our mobile application, thus enhancing their experience and ability to make decisions on any device. 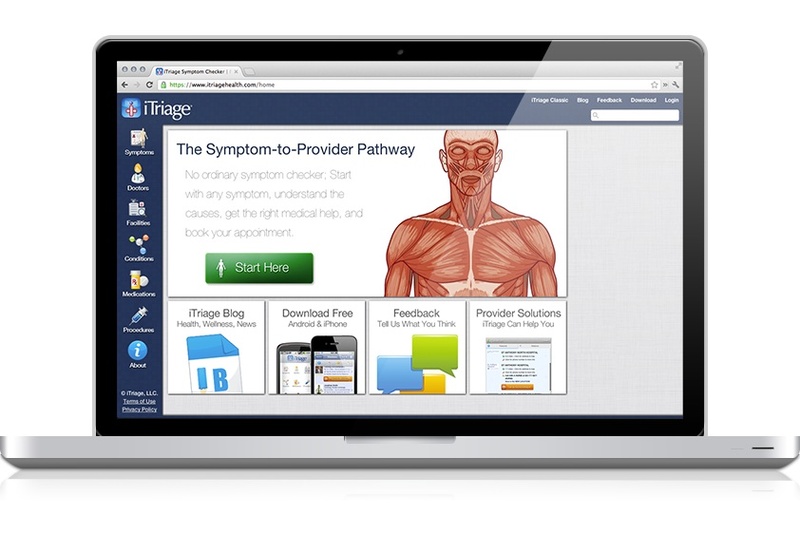 iTriage®, one of the market leaders in consumer health care technology with nearly 7 million app downloads on iPhone®, iPad®, and Android™ phones and tablets, today announced the launch of its new and improved website at http://www.iTriageHealth.com. iTriage is known for its mobile-first approach to providing actionable and user-friendly medical content at point of need. The new website expands consumer access and further supports the company’s vision of helping people world-wide make better health care decisions. With the recent Pew Research Center’s Internet & American Life Project showing more than 80 percent of Internet users looking online for health-related information, iTriage is now well positioned to serve Web and mobile users with its new cross-platform reach. iTriage LLC, headquartered in Denver, Colorado, is a global health care technology company founded in 2008 by two emergency medicine physicians. The company’s market-leading platform and mobile/website applications offer a proprietary Symptom-to-Provider™ pathway that empowers consumers to make better health care decisions. iTriage helps people answer the two most common medical questions: “What could be wrong?” and “Where should I go for treatment?” Millions of consumers around the globe have downloaded the free iTriage mobile app through the iTunes App store or Android Market, or used the iTriage website at http://www.itriagehealth.com/. In addition, thousands of health care providers already use the iTriage platform to reach more consumers and increase patient engagement. For more info, please visit http://about.itriagehealth.com/.